Last week we posted an article explaining how unwelcome trespassers have recently disrupted the environment and possibly killed a Devil’s Hope Pupfish (Cyprinodon diabolis), one of the rarest fish species on the planet. After hearing of this incident, we thought it would be interesting to learn more about how this fish can survive in such an inhospitable desert environment such as “Death Valley”. We begin with a little history of how this fish has survived more than one conflict with humans. Back in the 1960s, the Pupfish was almost wiped out due to water pumping activities around the geothermal springs where this fish lives. Fortunately for the Pupfish, environmental activists mobilized which led to a US Supreme Court ruling giving protection to the small population by declaring them an endangered species in 1967. Subsequent conflicts over ownership and use of the groundwater around Devils Hole led to further litigation in the 1980s and resulted in further legal protections for Pupfish. Described as the worlds rarest fish, less than 200 of these fish have been known to exist at any time since 2005. Despite conservation efforts, the population has been on the decline since the 1990s and fewer than 150 individuals survive today. The reason for the decline is unknown and attempts to establish a population outside of Devil’s Hole have been futile to date. Some claim that their demise is due to climate change but that’s an easy label to slap on about anything these days. Unlike the other flowing springs within Ash Meadows, Devils Hole is a still pool also known as a fracture spring. The pool provides an opening to a vast underground limestone cavern system of unknown depth. SCUBA divers have descended to 436 feet with no bottom in sight causing Devil’s Hole to be dubbed as “a skylight into the aquifer” according to the Great Basin Institute. Breeding and most of the feeding take place on an algae covered shelf measuring 11.5′ x 16.6′ that sits at a depth 1 foot below the waters surface. The shelf is situated at the foot of the shaft and the overall dimensions of this part of the pool are 11.5 ft by 42 ft. At the end of the shelf there is an abrupt drop-off of 28 ft. The substrate continues to slope downward below that depth. Over the course of 10,000 – 25,000 years ago lakes and waters of the area disappeared and the species was trapped in the aquifer where they remain today. The average water temperature stays between 92–93 degrees Fahrenheit year round making it difficult or nearly impossible for any aquatic vertebrates to survive. In addition to the high temperature, the water has a very low dissolved oxygen content and food is limited. It is incredible how a fish could live in such an inhospitable environment. In the summer and fall the species feeds chiefly on the algae growing on the shelf. Algae also grow on the substrate just off the shelf up to a depth of 50 ft (15 m) but Pupfish have been found swimming at even greater depths. In winter and spring, when the algae are much reduced, diatoms are the chief food items. The population varies from season to season and algae and seasonality effect the size of the population. Unlike other Pupfish, the males of this species do not set up breeding territories, a result and necessity of having such a small area where feeding and breeding occur. Spawning takes place primarily in April and May. Males closely accompany a ripe female to the algae-covered shelf, where they stay together and spawn at irregular time intervals over the course of about one hour. To date, the species has spawned in the laboratory, but no eggs were hatched. The University of Las Vegas, in order to gain a better understanding or the Pupfish, studied a more prevalent but similar species of Pupfish, the Amargosa Pupfish. Researchers learned that these fish have the ability to metabolize anaerobically for extended periods of time, which is likely an adaptation to the warm and oxygen-poor water in Devils Hole. To produce energy anaerobically, the Pupfish make energy from glucose in the absence of oxygen and their cells produce ethanol as a byproduct. It’s a wonder that they don’t become inebriated by their own metabolism. Researchers believe that there may be implications for cancer research since cancer cells also have this capability. 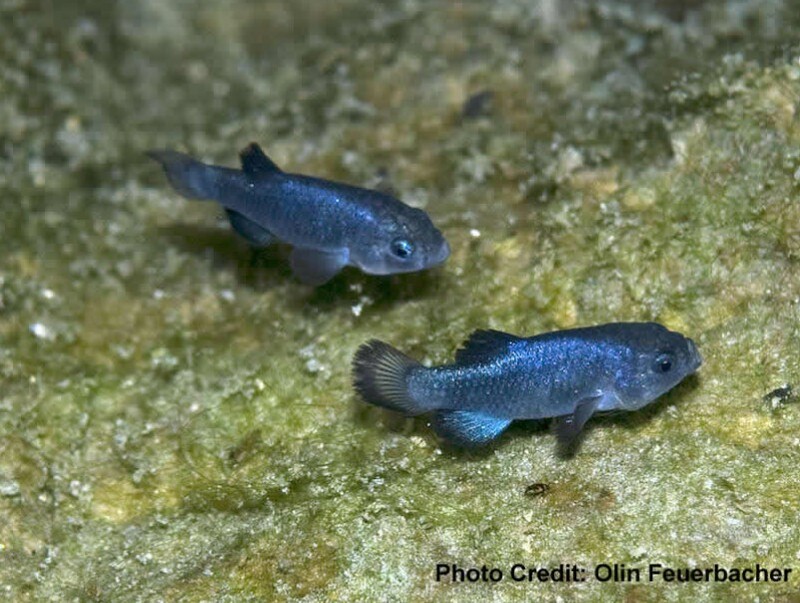 If the Devil’s Hole Pupfish are unable to survive, we could lose another species and never fully realize their greater significance through the scientific knowledge which could be gained from such an unusual little fish. Who Knew we had an 85 mile Long Coral Reef off the Coast of SC?